As industries have embraced market transparency, tools have emerged to empower people to make better decisions, whether for their businesses, personal lives, or both. Today, you wouldn’t buy a flight without comparing ticket prices, and you wouldn’t sell a car without first exploring its value online. In the freight industry, this type of robust market insight isn’t readily available. For shippers, rates are often obscure. While they rely on historical rate knowledge, they can’t see what the current market is doing or be sure that their freight prices reflect the broader market. Today, Uber Freight is introducing Lane Explorer, a first-of-its-kind tool within the Uber Freight platform. With Lane Explorer, shippers can view real-time market-based rates on their lanes up to two weeks in advance and quickly build loads that lock in those rates. 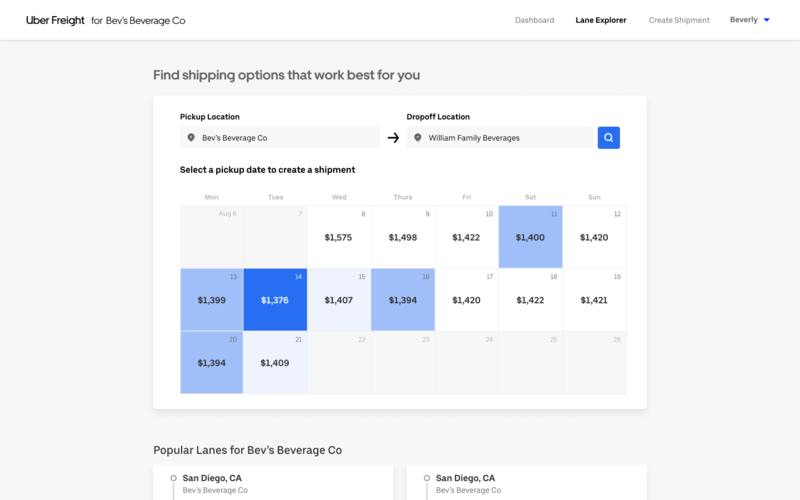 By giving shippers the ability to see what a shipment costs on any lane, every day for the next two weeks, Uber Freight is setting a new standard for price transparency. Improving visibility in the freight market creates opportunities for the entire industry, especially for small shippers like the beer experts at Narragansett Beer. As an Uber Freight shipper utilizing the new Lane Explorer feature, Narragansett has seen immediate improvements to their efficiency and operations. As Uber Freight continues to build a true logistics-on-demand solution, it will continue developing advanced features and tools like Lane Explorer. Our goal is that everyone in the Uber Freight network can run their businesses as smoothly and efficiently as possible. Lane Explorer is available to any Uber Freight shipper (go here to sign up) and empowers them to book the best shipments for their businesses and budgets.